How much confident are you in your trading habits? So you think you know your stock quite well ? You have that feeling when the stock would go up or down ? 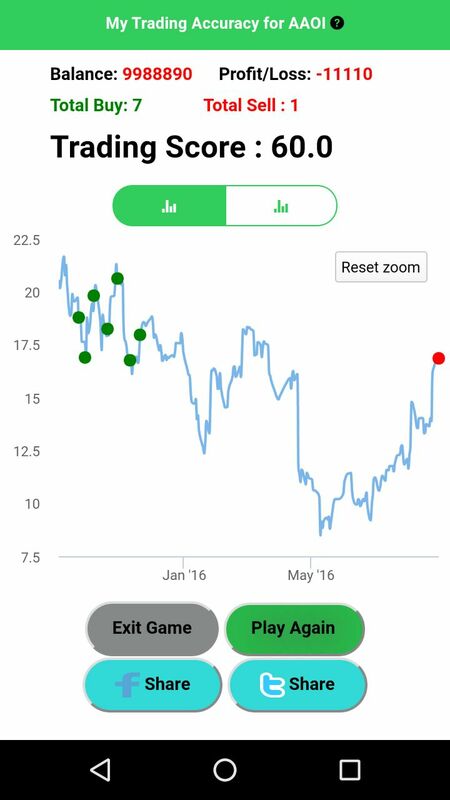 This is the game about, trying to develop the “trader instincts” for a stock. There are many people who just day in day out buy the same stock and if you ask them why they bought or sold it – they would say i feel it. Pro-trader would help people develop those trading instincts. You can see review your trading patterns, how good you were in finding those top and bottoms. Do you have biases in you regarding buying too early and then seeing price dropping more and wishing you had waited few more days to get better price ? The graph here showing buying accuracy vs selling accuracy shows you three circles – Red, Yellow and Green. 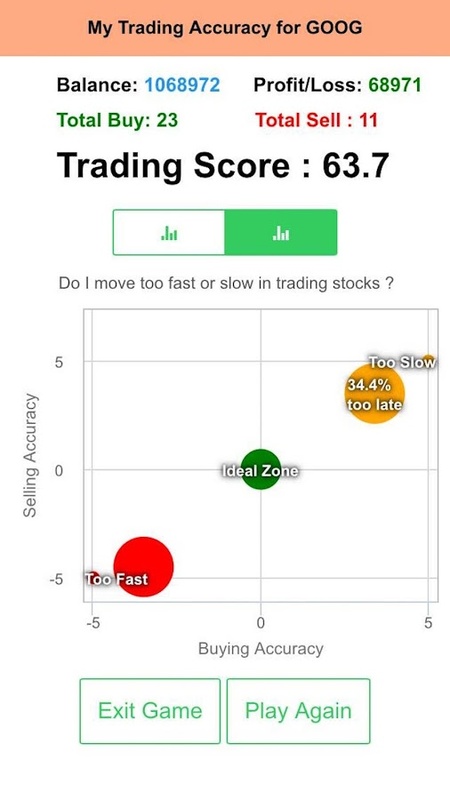 Red indicates your speed rush mindset and what percentage of time you were moving too fast in buying or selling. EEGs taken before and after the training showed that the biggest changes occurred in the brains of the group that trained using the “dual n-back” method. One of the two brain-training methods most scientists use in research is significantly better in improving memory and attention, Johns Hopkins University researchers found. It also results in more significant changes in brain activity. The “dual n-back” is a memory sequence test in which people must remember a constantly updating sequence of visual and auditory stimuli. The Johns Hopkins participants saw squares flashing on a grid while hearing letters. They had to remember if the square they just saw and the letter they heard were both the same as one round back. As the test got harder, they had to recall squares and letters two, three, and four rounds back. It’s a bit like the children’s electronic game Simon, but instead of just recalling sounds and colors, you have to remember the current sequence and the one a few rounds back.